There have been several questions very similar to this asked already (including ones not involving GeoServer), but their solutions have not solved my problem. I am trying to use GetFeatureInfo on my GeoServer WMS layers, which are hosted on a different domain than the website on which they will be used, and have since learned that I need a proxy to accomplish this. I have followed the instructions on how to set this up in Tomcat 6 (except for renaming .jar file as it's unnecessary in v6), added www.greengeography.org and the IP of my local network to the proxy.cgi file, then changed the top line to #!/usr/bin python as that's where it's at in Amazon's EC2 Linux (and also tried a slash instead of space as I've seen both ways). I am confused on URL mapping, servlet mapping, and where to create a CGI directory, so I tried it in just about every location within the /tomcat6/webapps, including the main GeoServer directory. The only place I am able to access the CGI file in a browser is at the root. Why can I not make this happen in the GeoServer directory, which is where I think it needs to be? I did not see instructions about changing the URL mapping, so I'm not positive it's the problem. As suggested in several other questions posted on this site, I attempted to install the GeoServer Proxy Extension instead of configuring this stuff manually, but every time I tried to access it from the GS admin page, I got Java errors (no matter which version of the extension I tried), so I gave up and went back to manual. 2012-02-13 23:52:22,922 ERROR [config.XMLConfiguration] - Configuration file cannot be read or does not exist! 2012-02-13 23:52:22,923 ERROR [layer.TileLayerDispatcher] - Configuration /usr/share/tomcat6/webapps/geoserver/../resources contained no layers. If you feel I should've been able to solve this given that there have been so many similar questions asked already, that's fine, but please don't down vote it, because I did do my research. 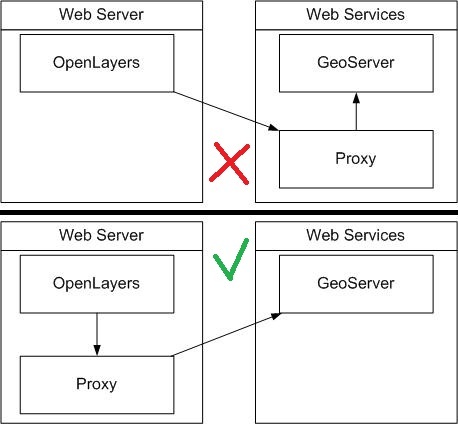 You should be pointing OpenLayers to a local proxy. Not the proxy on GeoServer. Not the answer you're looking for? Browse other questions tagged geoserver openlayers-2 tomcat or ask your own question. GeoExt WMS GetFeatureInfo in proxy server. Problem - popup is empty in chrome and not responding in firefox? How to configure Proxy.cgi file for Geoserver On Tomcat? How to configure proxy.cgi in windows using apache and geoserver?